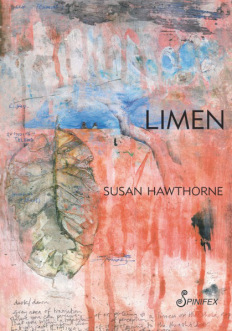 Limen by Susan Hawthorne. Nth Melbourne. Spinefx Press. 2013. This is an act of poetry described in a poem. It is a loose, easy, open poem that travels in the narrative of a summer holiday camping trip caught in a rising flood. The characters, woman 1, woman 2 and dog describe their inner and outer landscapes as events unfold and the flood keeps rising. The prologue reminds the reader of ‘”tongues/ unforked for renewal/ muscles unwound/ ready for life’s next pounce” and moves gently into a naked river swimming, sensuous, camping holiday that seems to take place around the new year. We could be anywhere in Australia as there are no place names except the weather and the descriptions of the bird life, a cormorant. “…in the melaleuca/ its paperbark ruffled/ as a frilled ballgown” – perhaps takes us to a place coming into the wet season, North Queensland, the Northern Territory? It is also a very feminine book. Its images and metaphors, its slow unfolding, its fears and joys celebrate the feminine. The hero might be the dog or the boys, but it is also not woman 1 nor woman 2, who seem to have a gentle solitariness about their togetherness. I feel a little voyeuristic reading this novella, as if I have been let in, a little, to a world of women where I have never been. These women are easy with each other. They are relaxed and happy with each other – even the stranger women are loose and joyous. I may have been in such company once or twice in my life, but if so, I cannot remember it. Yet the book brings old hippy memories close again and I remember the wonderful feeling of being publicly naked. There are some beautiful simple, black and white pencil drawings throughout the book which soften its softness even more, so that the epic poem/novella becomes an understatement for something far larger. Perhaps it shows me what to do with peace, a matter that has concerned me for some time. Patrick McCauley writes poems and essays, grows tomatoes and goes fishing around Clunes Victoria. This entry was posted in Issue 9, Limen, Patrick McCauley, Spinifex Press, Susan Hawthorne and tagged Australian Literature, Australian poetry, Australian Womens' writing, Spinefx Press, susa, susan hawthorne by Mark Roberts. Bookmark the permalink. With more extreme events forecast, this might be the first wave in a storm of holidaymakers-turned-survivors type stories.